The great soprano Sena Jurinac passed away on Tuesday at her home near Augsburg in Germany. This information was confirmed by the Wiener Staatsoper, for many years Jurinac's home theatre where she had her greatest triumphs, and where she received the title of Kammersangerin. Born in Travnik in Bosnia (formerly Yugoslavia) in October 1921, Jurinac studied in Zagreb, Croatia, and made her debut in 1942 as Mimi in La boheme. 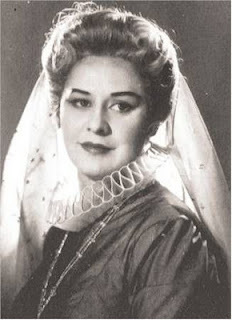 Jurinac first sang at the Wiener Staatsoper as Cherubino in 1944 and remained a member of the company until 1983 when she made her farewell as the Marschallin. In the English speaking world, she was a favourite at Covent Garden and Glyndebourne, but sadly she never sang at the Metropolitan Opera. Rudolf Bing, in his memoirs, stated that he invited her on several occasions in the 1950's but Jurinac turned down the invitations. A specialist in Mozart and Strauss, she was a celebrated Contessa, Cherubino, Octavian, and Marschallin. She also sang Puccini - an estimable Butterfly - as well as Marie in Wozzeck. The Jurinac soprano in its prime was a gorgeous instrument, noted for its opulence and richness, particularly in the middle register. Her stately and aristocratic bearing on stage was a pleasure. She made relatively few recordings, but her most celebrated appearance on video is her Octavian opposite the incomparable Marschallin of Elisabeth Schwarzkopf in Der Rosenkavalier, with Herbert von Karajan conducting. This video has never been out of the catalogue, and recently remastered with fabulous results.